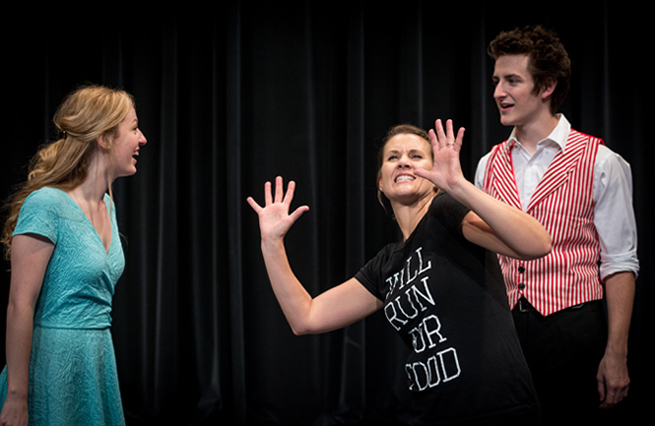 Director Dawne Meeks demonstrates some on-stage moves to Big Fish cast members Ryce Garren (Amos Calloway) and Sarah Yarbrough (Sandra Bloom). Life sometimes comes full circle. That’s something Dawne (Swearingen ’95) Meeks, director of this year’s Homecoming musical Big Fish, can tell you about. Meeks came to ACU as a freshman in 1991, the same year Adam Hester (’77) became chair of the theatre department. 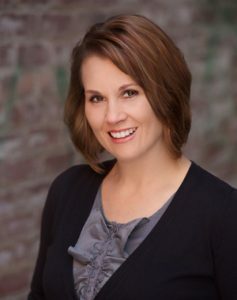 After graduating from Abilene Christian in 1995, she went on to earn an M.F.A. in acting with a specialty in directing from the University of Arizona. Dawne Meeks will take over as chair of the ACU Department of Theatre this fall. Now, 23 years later, she is set to take the reins from Hester as department chair. Hester will continue his role as professor of theatre, teaching acting and directing courses, along with playwriting. He also will direct productions throughout the year. While Meeks was a student under Hester, he tapped into her talents as a choreographer for several of his shows. Now, Meeks, who is associate professor of acting and movement, is tapping into the talents of one of her students as choreographer for Big Fish – coming full circle yet again. 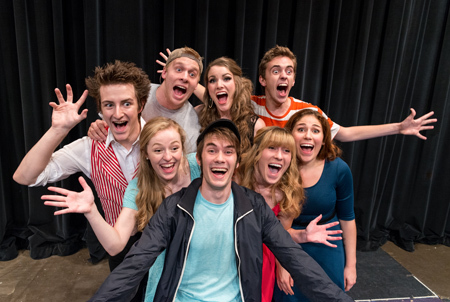 This year’s musical will represent the collegiate premiere of Big Fish. What drew you to this particular show? I saw Big Fish last year with my husband. We had the pleasure of seeing one of our alums, Lara Seibert (’06), perform in the Broadway show, and she graciously gave us a backstage tour. I fell in love with story. I feel it’s one that everyone can relate to. It’s the beautiful homecoming tale of a father and son – a prodigal son story in some ways – and a story of redemption, faith, love, community, renewal and acceptance. As the son discovers he and his wife are going to have a baby, the father learns his life is coming to an end. It’s the ying and yang of life, the careful balancing act we humans find ourselves working through. Edward Bloom has always told big tales, and his son, Will, takes a journey revisiting stories of a mermaid, witch and giant. These characters represent so many magical things to stir our inner child and yet speak to the adult soul. The music is stirring and moves much like the river that is a major metaphor in this story. Big Fish is a story that I believe will touch our patrons and challenge our students. What excites you most about this year’s musical? I love the simplicity and heart of the story as told through the music. I also am excited that we are working with a guest digital artist from New York City, Andrew Lazarow, who works with Andrew Lippa, the composer and lyricist of Big Fish. We are using technology in new ways, and that is exciting. I love that we are working with two student costume designers, Alexandra Eddins and Amanda Martin, who are creating the fantastical heightened characters in the show. They are co-designers with Sandy Freeman, our lead costumer and faculty member. What better way for our students to grow and learn than to have the opportunity to work with professionals and our alums? What will the audience find most exciting about this year’s production? I love that we have a full 25-piece plus live orchestra. It’s a rare blessing for performers to have the opportunity to work with live musicians, with a brilliant conductor, Dr. Steven Ward (’92), and to perform in a theatrical house that seats 2,100 people. I find that the audience is always captivated by the live elements coming together in time and space. I believe they also will be charmed by the unexpected and magical characters Mermaid, Witch and The Giant. Tell me about theatre alumnus David Utley (’99) and the role he is playing with set design. David is a professional scenic designer who has designed for Glee, Always Sunny in Philadelphia and is currently working on a new film, The Nice Guys, with Ryan Gosling and Russell Crowe. David and I were in school together, and it’s been thrilling to collaborate with him and alum Nate Parde (’99), another of my classmates. Nate is now a professor and lighting designer at the University of San Diego and Old Globe. What challenges has this particular set design posed? The digital work is new to us and relatively new to Broadway, and so there are have been several hurdles, but I know it will all come together to allow a beautiful story to be told. The show moves to so many different locations so quickly that using digital images and video allows us to travel there faster. The upstage wall will essentially become a giant movie screen to underscore thematic ideas and moments of action we see on stage. Also, our professor Gary Varner, scenic and lighting designer, went into emergency surgery last week, and that has been an unexpected challenge. Gary is our dear friend, and we have worried and prayed over him. Gary keeps all things technical moving forward. He is smart and creative, and he is our people gatherer; he is the department storyteller. With Gary out, we have had a lot of long-distance communication between our guest designers, and they have rallied, as have our students. Adam used your talents as a student choreographer for several of his shows. Now, you are utilizing one of your students as choreographer for your production. Seems kind of cool that things are coming full circle that way. What can you tell me about that? I am thrilled at this full-circle experience. Senior theatre major Eean Cochran has performed in two national tours over the last two years, Dream Girls and Bring it On. He worked as dance captain in the last show, as well as performing, and found he possesses quite a skill at choreography. I loved the idea of passing on this opportunity to a talented, bright, creative spirit like Eean. His work is beyond his years, and I am so proud of him. At ACU, you have directed Grand Night for Singing, Little Shop of Horrors, Titanic, Emma, Star Spangled Girl, The Crucible, Glass Menagerie, Triumph of Love, Footloose and co-directed Les Miserables. What has been your favorite production to direct? That’s a tough question because every single piece was unique in its own way. Les Mis was a dream experience. It was so very special to collaborate on with Adam Hester as a colleague. We had worked together many times before as professor and student but had not collaborated since 1998, other than Senior Showcase, so that was amazing. And of course, Les Mis is such an epic story to tell. Glass Menagerie also was a magical journey for me. I love the works of Tennessee Williams, and I utilize the text from Street Car and Cat on a Hot Tin Roof each fall semester for my intermediate acting class. This was my first Tennessee Williams play to direct. The text is almost like poetry, so thick and languid, and I had an unbelievable cast. Some of the moments in that process were breath-taking for me. What do you try to bring out in the young artists with whom you work? I want our students to find their own strengths and uniqueness. They are called to the work much like prophets, and I want them to trust in those talents God has placed within each of them. It is an honor to work with and teach them because I learn so much from them every day – it is inspiring. What kind of legacy are you inheriting from Adam Hester as department chair? It is humbling, and I am so incredibly honored to be asked to step into that role. I entered ACU as a freshman in 1991, the year Dr. Royce Money (’64) became president and Adam became theatre chair and our department became its own department. It is another full-circle moment for me. Adam and his wife, Donna (’89 M.A. ), along with all of our faculty and staff, have moved our department to new levels of success that are thrilling. I am grateful to have had the opportunity to study under many of our faculty as a student and to be a collaborator with them for the last 10 years at ACU. I have big shoes to fill but I want to lead with energy and humility in the way Adam has, walking and dreaming together with colleagues and students. You have several family connections to ACU. Tell us about those. My brother, Ryan Swearingen (’98), majored in theatre and performed many prominent roles; I was a senior the year he was a freshman. My parents attended Pepperdine University but have had such a love for ACU that ACU might as well be their alma mater. They have been wonderful supporters for years, and my dad, David Swearingen, currently serves as executive-in-residence for the College of Business Administration at ACU. I love the Abilene Christian community – faculty, staff and students. I love that when I meet prospective students they say there is something special about ACU and that it feels like home. I love my ACU Theatre home. I am grateful to be a part of something magical. I believe what we do matters and that it is missional. We are storytellers like Edward Bloom, the leading role in Big Fish. May we all see more deeply, and speak our stories with authentic love as we journey on at ACU.